Join the "TEN on TEN" campaign! Donate $10 on Oct. 10 for NMO. 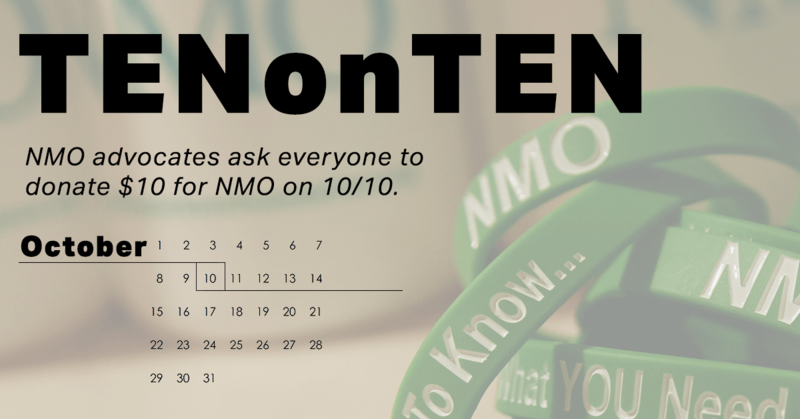 NMO Advocate asks you to join “TEN on TEN” for NMO research. Well, it may not be the ice bucket challenge, but if the NMO community takes part in a big way, we can raise real money for NMO research. Let’s storm social media on October 10 for a one-day fundraiser for all of us! On October 10, the 10th day of the 10th month, let’s ask our entire networks for $10 for The Guthy-Jackson Research Foundation. TEN on TEN is a new fundraiser designed to include as much of the NMO community as possible with an easy ask – that on this one day, we can all help advance research to find a cure, by asking our family, friends, colleagues and social media contacts for $10. As you all know, when people donate to The Guthy-Jackson Charitable Foundation, 100% of their contribution goes to research. A third way to participate would be to create a Facebook TEN on TEN fundraiser. Visit The Guthy-Jackson Charitable Foundation’s Facebook page to learn more. Have fun with it, and let’s shower The Guthy-Jackson Charitable Foundation with tens of tens of $10 on the 10th day of the 10th month! Any questions or concerns? Please contact me at diningfornmo@gmail.com. Note: You can also donate to a specific fundraiser or make a specific honor/memorial donation. Make this Donation "In Honor Of..."
Make this Donation "In Memory Of"
By filling in the following fields, you consent to having the foundation share your donation with the individual or group specified below.